715 Dunas Douradas is a 4 bedroom Premier Villa located near Vale do Lobo, part of the central Algarve, Portugal. This Luxury modern house is furnished to an extremely high standard with top quality fixtures, fittings and soft furnishings, and is only a few minutes' walk to the beautiful Dunas Douradas beach. The villa is located in between Quinta do Lago and Vale do Lobo allowing you to enjoy some of the finest golf courses in Europe. The busy town of Almancil is about 7km away. Shopping is available at Quinta shopping and in Almancil, and also at the Vale do Lobo shopping centre. There is a plentiful choice of restaurants within a 10 minute driving radius of the villa, and the beach and beach bars are only a 5 minute walk away. Double bedroom ensuite, with its own kitchen, dining area and lounge plus games area (table football). The terrace surrounding the large pool is furnished with good quality sun loungers, outdoor dining table and chairs, and a gas BBQ, allowing you to enjoy dining al fresco. All prices are per week for the villa only. Villas are booked from 2:30pm on your arrival day (Thursday) to 10:00am on your departure day (the following Thursday). Please note that availability shown is subject to confirmation - please call our reservations team. Vale Do Lobo, situated east down the coast from Quarteira and ideally between Quarteira and Faro, is a self contained luxury leisure Algarve resort. 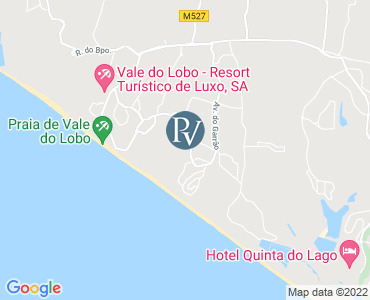 Vale Do Lobo means "Valley of the Wolves" - no wolves here though, just a luxuriously delightful landscaped Algarve resort base set on the sand dunes situated west of Faro. Nearby Algarve Golf Courses, ample tasteful resort facilities such as water sports, restaurants, bars and shops are here, combined with stunning sandy beaches. Vale Do Lobo is Quarteira is luxury sister suburb if you like - quiet, self contained low rise luxury. Vale Do Lobo is perfect for luxury family golf holidays. It is luxury low rise accommodation here, specifically villas, with gorgeous sandy beaches with promenades lined with bars, restaurants. It is easy to book into numerous outdoor pursuits here including horse riding, cycle hire, walking trips, jet-ski hire and boat trips. The Parque Natural da Ria Formosa is just next door - you're pushing down into the more rural east Algarve here at Vale Do Lobo. Not only are you based in a stunning Algarve beach base here in Vale Do Lobo, the sand dunes mingle with beautifully landscaped pines, green lawns and lakes. Someone has put a lot of thought into this resort's design! Its biggest draw however is its location near some of the best Algarve Golf Courses. Royal Golf Course is situated directly on the cliff coast with stunning sea views. Designed by Golf Architect Rocky Roquemore this 18 hole/par 72 golf course is one of the most popular on the Algarve. That's not all, golf fans. Ocean Golf Course is also in the Vale do Lobo area, again right on the coast adjacent to pine and eucalyptus trees. The fairways run right down to the beach at this stunning Algarve golf course. Both the Royal Golf Course and Ocean Golf Course are superbly equipped with clubhouse, golf academy, putting green, and golf shops all on-site. Both these golf courses are popular with professional golfers. It is not just luxury golf courses on the menu in the Vale do Lobo area; you are in luxury spa and fitness territory, too. Plus championship tennis, lawn bowling and ample events and conference facilities are all available.